HGM students lead and compete in many academic teams at North Hollywood HS, often starting new ones. In addition, many HGM students participate in school Clubs and Athletics. Academic decathlon is an event where competitors are tested in ten subjects- social science, mathematics, science, economics, music, art, language and literature, an essay, an interview, and speech. Each year, these subjects are centered around an encompassing theme or era, such as the Great Depression, the Age of Empire, or Russia. An Academic Decathlon team consists of nine members, divided into three divisions, determined by GPA. The team begins preparing in the summer, as soon as the the theme is announced and the study material released, and begin competing in February. 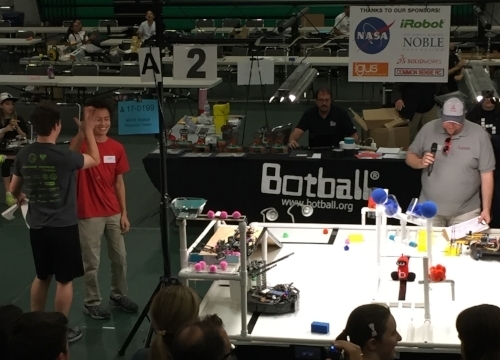 The Botball competition is an annual robotics tournament in which each team is required to construct and program several robots to work cooperatively in a two minute game. Throughout the game, the robots are often required to pick up and transport various objects around the board in order to score maximum points. Before the Botball’s competitive season begins, our club provides instructions on computer science and engineering up to an advanced level to any student showing interest. As our world continues its inexorable march into technology, people with skills and engineering stand at the frontier of this march. As we introduce students to the world of computer science and engineering, we are fostering students to become the scientific pioneers of tomorrow. CyberPatriot is the nation’s premier high school cyber security competition. In the first three rounds, students compete online in teams of 5 to secure Windows computer operating system by: setting property security settings; removing malware, viruses, and unsecure programs; and removing other security risks. Additional challenges added after the first round include: linux operating systems; decoding & decrypting; and network configuration. The team also receives financial support from LAUSD's Beyond the Bell program. Meetings/Season: August - December: 1-2 afternoons per week + 1 Saturday/month. Additional meetings depend on teams qualifying. 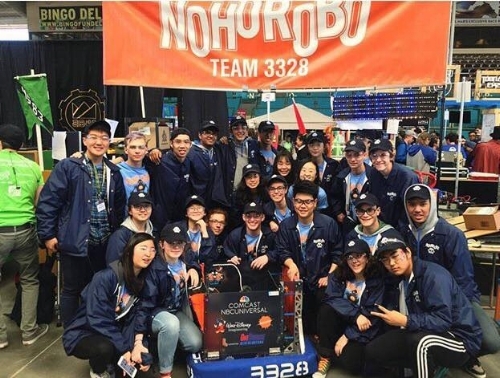 THREE NoHo CyberPatriot teams went to National Championships in 2017 and 2018. NOHO DECA is a business-oriented team that provides excellent education and preparation in the fields of marketing, finance, business, hospitality, and campaigning. During the conferences, the participants compete through written tests, a high school version of the Master of Business Administration Test, and an interview involving real business administrators. Our meetings are every Tuesday and Thursday after school. Tuesday meetings are mandatory (preseason and postseason); however, the Thursday meetings are mandatory only during season. Our seasonal time commitments would be about 5~9 hours a week and studying about 30 minutes every day outside of meetings as well. Each year NHHS teacher/attorney Paul Landau coaches students who are eager to compete nationally and gain valuable legal experience for the Duke Moot Court competition held at the end of February at Duke University in Durham, NC. Students work in teams of two and argue both sides of a hypothetical Supreme Court appeal involving complex constitutional law issues and students’ arguments are based on actual Supreme Court decisions. To prepare, students spend hours with Mr. Landau and experts in the legal field, including lawyers and judges. This unique experience provides students with the opportunity to travel to the eastern U.S. and compete in a nationally established competition at a renowned university. Ambassadors in the United Nations are the faces of their countries when they tackle crises playing out on the global stage. By emulating those ambassadors in Model UN, students immerse themselves in international politics, gain valuable public speaking skills, and get to know people from literally all over the world at MUN Summits. NoHoMUN meets on Wednesdays during lunch, and in the weeks prior to a conference, until 5:30 after school. As a new, student-led club, NoHoMUN has been very successful on the Novice level but has also received top honors at major national conferences in the Advanced division. The talented dedicated musicians of North Hollywood's Instrumental Music Program win many awards and are led by Mr. Sharp (perfect name). We perform at many events throughout the year. Click on each performing group for more info and check out our videos. The FIRST Robotics Competition requires our team to build an autonomous and tele-operated robot which participates in a sports-like challenge. Every year in just six weeks, we build, design, and program the robot from scratch. From January to the middle of February, our team of twenty-five students works together everyday after school, not only to build a robot, but also to build a team. We fund this expensive competition by contacting companies like Comcast NBCUniversal and Disney among many others for sponsorships and grants, thereby gaining valuable real-world business skills. We are always looking for new members interested in any of the many facets of robotics and business! Our tryouts are in the fall at the beginning of each school year. We hope to see you at tryouts! Quiz Bowl is a fast-paced, Jeopardy-style competition in which two teams of four members each compete to answer a series of questions about topics ranging from history and philosophy to biology and physics and from the fine arts to sports and popular culture. North Hollywood High School’s Quiz Bowl organization fields some of the most successful teams in Southern California. Quiz Bowl tournaments give each team member the opportunity to experience the camaraderie and competitive rigor unique to the world of academic tournaments and to compete against intelligent, like-minded individuals. Like Science Bowl and Ocean Sciences Bowl, Quiz Bowl is a “buzzer” competition; members use lightweight electronic buzzers to indicate that they wish to respond to questions posed by a neutral moderator. Science Bowl is a jeopardy-style buzzer competition in which two teams of four compete to answer a series of science-based trivia questions. Consisting of science subjects such as Biology, Chemistry, Earth and Space Science, Energy, Math, and Physics, this competition tests the depth of students’ knowledge and the speed with which they can apply that knowledge. NoHo team has won the LA County tournament almost every year since 1999, usually reaching top 3 at Nationals. Science Olympiad is a national science competition in which teams are presented with a set of 23 challenges each year. These challenges cover the entire range ofthe STEM subjects and engage students in learning, experimenting and inventing well beyond class curriculum. Team members are given a fantastic opportunity to immerse themselves in areas they might have never encountered before. For example, one might study supernovae and their remnants or explore the mysteries underlying the human genome. Students are also challenged with hands-on engineering & technology tasks. Such tasks have included building a musical instrument entirely from scratch, creating a Rube-Goldberg device that can be set to operate within different time constraints, and building remote-controlled robot arm(s) to transfer objects of different shapes. Whatever the challenge may be, Science Olympiad members are always applying their ingenuity and creative thinking to different situations. With over 100 members, North Hollywood HS Speech and Debate is the biggest team on campus. Our competition-based forensics team develops skills in public speaking, debating, performing, and original writing to compete against students from all over the nation. Students may choose to compete in different types of "Events," from Individual Events (speech) to Congress to different forms of Debate. Our highly active team welcomes both regular and casual participants. Every year, students qualify for state and national championships and the prestigious Tournament of Champions. One of our members was selected for the USA Debate Team, representing our country in tournaments all over the world and winning 3rd place at the World Schools Debate Championship in 2017.